I was quite proud of myself today; I pulled this exact outfit out of my closet and didn't leave 324987 other things thrown on the floor. If you're a fashion blogger or just a girl- you can relate to this! Love this look! Really love your watch!! 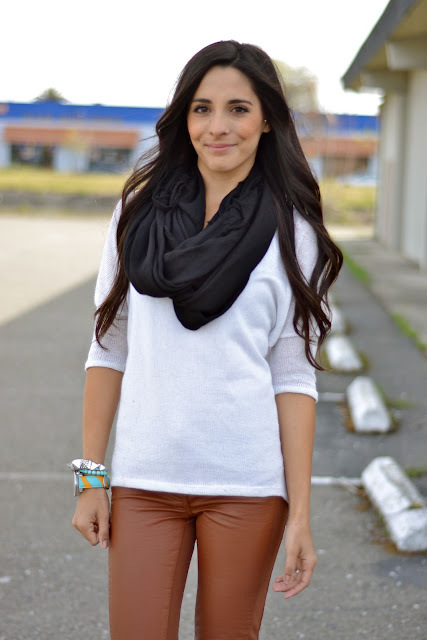 Adorable- those leggings are so flattering on you! You're right. It is way hard to make leather pants subtle LOL. You do, however, look GREAT in them! I am such a sucker for leather. Oh and congrats on the clean getaway from the closet! I can totally relate! like the arm candy you go on, lovely colors! and fun photos, i would like to try leather pants, preferably black. but you got great legs so work those pants girl! I love the leggings!! That loose top really makes it. just discovered your blog through currently obsessed! you have such cute style, i love how simple and chic this outfit is! : ) definitely going to start following! I love this outfit but I am kind of upset because I have the same shirt and it looks wayyyyy better on you! Hah, you definitely win on "Who Wore it Better."